Junichi Usui, a Japanese musician has an aspiration to learn and play Vietnamese traditional music. He has started studying Vietnamese folk music since September, 2017. Junichi Usui was introduced to Vietnamese traditional music while seeking information of Japanese royal music for his Korean friend in 2015 then he read an article of a conference on royal music of various countries with the participation of heads of Asian music schools. 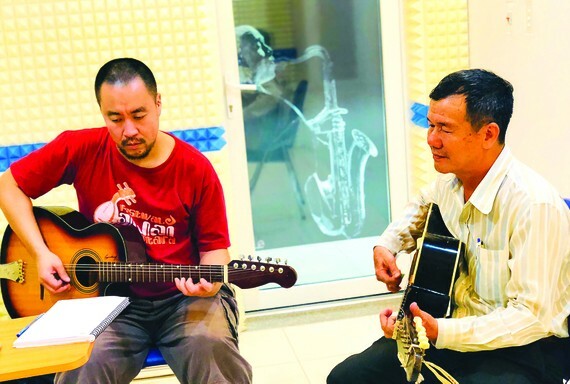 The Japanese musician registered to join in the meeting and at that time he met artist Mai Thanh Son of the Ho Chi Minh City Conservatory of Music who helped him to connect with Vietnamese traditional music teachers. From September, 2017, Junichi moved his basement from Tokyo to Ho Chi Minh City, Vietnam by strong interest for South East Asian culture, wishing to explore more culture here and to bring more interesting arts and music from Vietnam. He has studied Vietnamese guitar with Meritorious Artist Huynh Khai, and Dan Bau, the Vietnamese monochord zither with People’s Artist Phuong Bao. He now is also studying Vietnamese language to learn Ca Tru singing (Vietnamese ceremonial songs). According to the Japanese musician, melodies of Vietnamese traditional music are very special and different from other countries. He is interested in its emotional rhythm and fineness, creating a colorful space. He wants to explore Ca Tru that has melodies similar to the old traditional songs from the north of Japan, Esashi Oiwaki. Born in 1977 in Tokyo, Junichi had spent 15 years for learning Japanese traditional music and kept independent activities for music, art, films, theatre, poetry, event organizing. He also studied folk music of other countries, such as Indonesia, Korea, India, Malaysia, and Ireland. With violin, voice, sho (Japanese mouth organ), electric guitar and other gears, Junichi's music skill’s flexibility covering from traditional music through popular music till experimental has been acclaimed by audience and collaborators over the places where he performed. Junichi also has ever joined in gigs and collaborations with local musicians and artists in foreign countries such as Korea (2014, 2015), New York City(2015), Italy(2015), Indonesia(2015, 2016), Taiwan(2015) and Malaysia(2016).